We have 44 days of fall left, but the beautiful fall drives are over, so how do we continue to celebrate this shoulder season? I’ve got a few suggestions. November isn’t a big getaway month for most people, but the “shoulder season” is a wonderful time to travel in Colorado. There are less cars on the roads, and unless you’re traveling on Thanksgiving, you’ll find some great hotel deals over the next 44 days. An elk herd near Estes Park, Colorado. 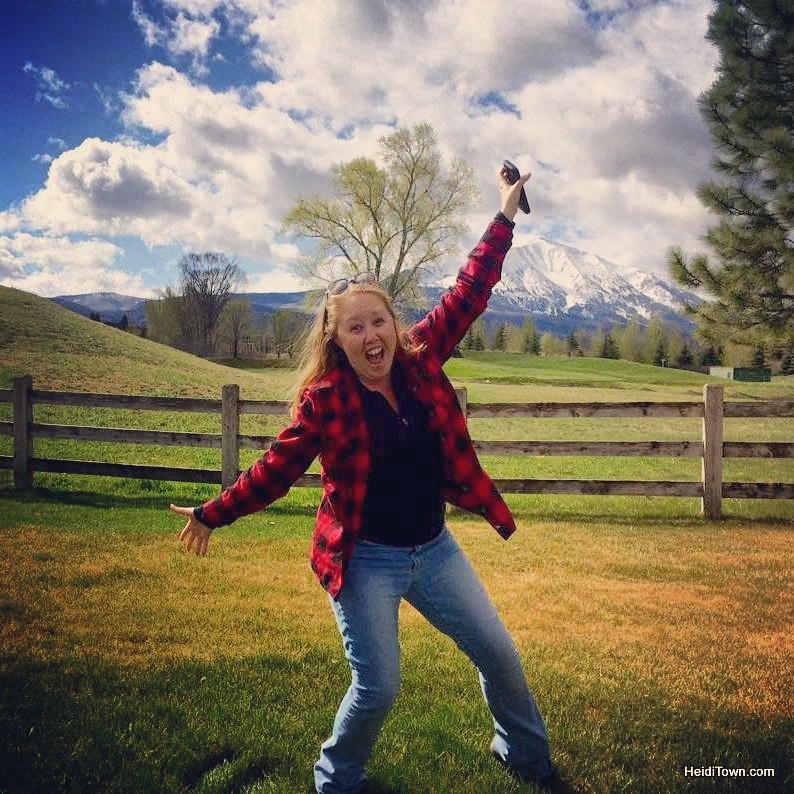 We have a tradition of doing birthday getaways in our house and since my husband’s birthday is in November, we’ve done quite a bit of fall travel in Colorado. Denver is actually one of my top picks for this time of year because the city dresses up beautifully for the holidays and it’s fun to stroll a brightly lit up downtown. 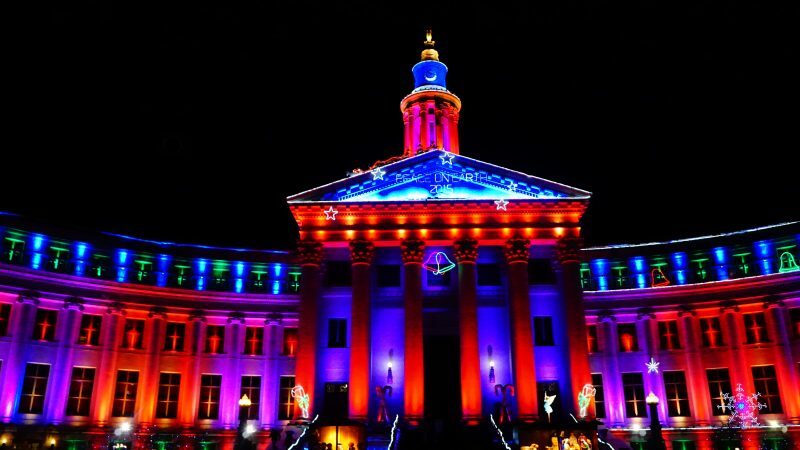 Denver City Building lit up for the holidays. Photo by Lisa Kral, Dancing in my Head Photography. This is also an excellent time to visit Estes Park, especially if you like elk. We were there last November and witnessed a huge herd of elk walk slowly through our vacation rental property – The Rustic Acre, just south of downtown Estes. 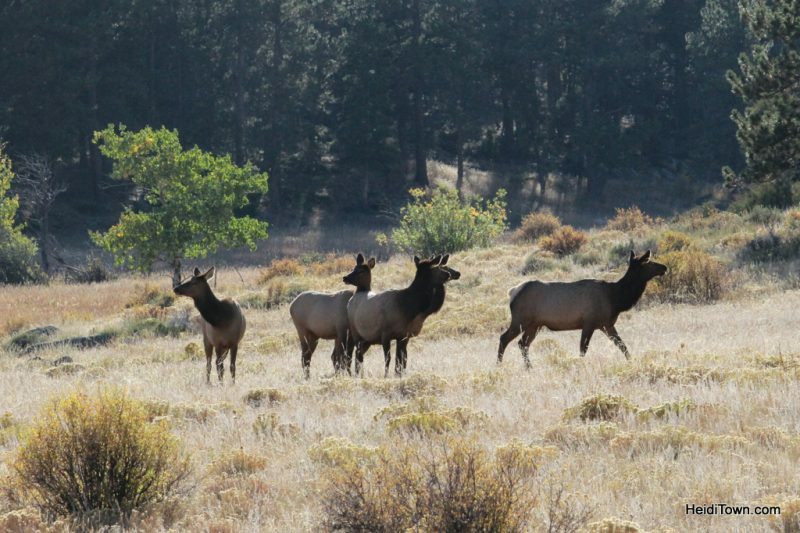 But it doesn’t matter where you stay, the likelihood of seeing elk in Estes in the fall is about 99.9%. Also, Estes Park could use your patronage right now, as the current closure of Hwy 34 between Estes and Loveland is sure to have some negative effects on small businesses throughout this touristy town this fall and winter. Georgetown Christmas Market. Photo courtesy of Visit Clear Creek County. If you’re looking for a memorable holiday-oriented getaway this fall, consider planning a weekend around Christmas at Hamill House in Georgetown. We attended this event several years ago and it’s even bigger now with several museums involved and a multiple course dinner. And of course, the Georgetown Christmas Market is a half-century long Colorado tradition that shouldn’t be missed. And speaking of the holidays, there are many ways to get into the spirit over the next 44 days. From Golden’s Candlelight Parade, which we experienced, and I wrote about last year, to Race of the Santas in Breckenridge. If you’re looking for some Christmassy fun this fall, you won’t have difficult finding it. 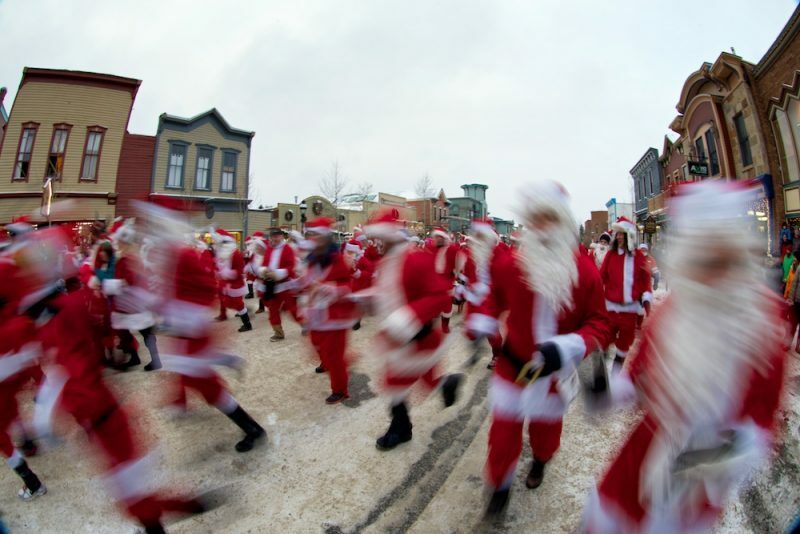 Race of the Santas. Photo courtesy of the Breckenridge Tourism Office. 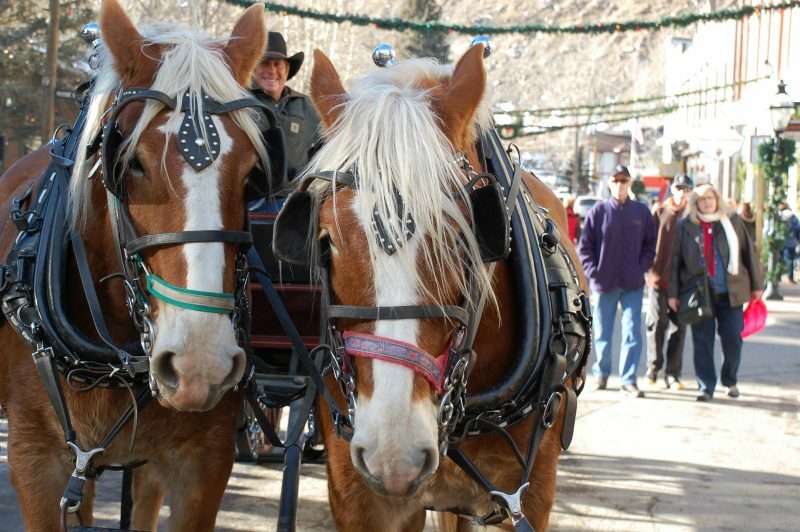 Each Colorado town has their own tradition, whether it’s a tree lighting ceremony or brass band appearance, and I guarantee there’s a holiday event happening near you during the next six weeks. As longtime readers know, I’ve been writing dinner theater reviews for a local newspaper for a decade, and this is the time of year when a lot of extra special performances starts happening on stages around Colorado. I’m especially excited for “Thoroughly Modern Millie,” coming to the BDT Stage in Boulder (formerly known as Boulder’s Dinner Theater) on November 19. Candlelight Dinner Playhouse in Northern Colorado has “It’s a Wonderful Life” (Nov. 25 – Dec. 25, 2016), and it doesn’t get any better than that, especially if you’re looking forward to Christmas.